An indisputable truth of historical research is that any conclusions drawn from the source material is inevitably shaped by subjective reasoning. This is why every researcher should always go back to the source to form their own opinion. Luckily we live in an age when a wealth of source material magically appears on our computer screens, only a click or two away… but far from all of it. The Voynich papers at the Beinecke library at Yale have not yet been digitized, and only have a cursory description at the website. Much of the current understanding of the provenance of the ms. is based on these papers, so I wanted to see them in person. This last June, I was able to spend almost two full days looking through them. And, also as expected, my impression was very different from that of others. I will soon write up my findings, and opinions on them, in what will possibly be three or four blog posts. But as also often happens when searching for information in archives, you find more than you were looking for. In this case, I found two images of the f1r “signature” of Jacobus de Tepencz, which I thought I had not seen before. Although I am no expert on the signature, I felt I had enough of an understanding of it, and the stories and controversies around it, to believe these images were of importance. So I took a couple of pictures of them, and sent them to Jan Hurych- who wrote several articles about the VMs signature- and is also someone whose opinion I respect and admire. He affirmed my suspicion that these images may be previously unpublished, and possibly of importance to Voynich research. That was enough for me, and I told him I would write them up. The first image, shown above (click on image for full size), first appeared to be a below average image of the familiar first page of the Voynich Manuscript, f1r. But the penciled note on the photo reads, “To be kept- Rotograph without autograph before it was chemically restored”. This is what caught my attention, because the “chemical treatment” of the signature- why and when it was done by Voynich- has been a long running controversy. For one thing, it has been surmised that Voynich treated this area to see IF there was a signature. Another claim was that he “accidentally” spilled photo developer on it, revealing the unseen signature. However, as you will see in the full size version of my photograph of the “Rotograph”, the signature is at least partly visible. It is even more prevalent on the original, as I only shot this with a hand held camera under room and window light. In fact, almost all the letters are visible. So that begs the question, “Why?” would Wilfred apply chemicals to this? One clue may be in the penciled note, which I believe is by Anne Nill: Perhaps “chemically restored” then means that Wilfred was trying to “enhance” the signature. Another issue is that it has been claimed the signature was originally “erased”. Perhaps erasure was attempted, and caused the signature to be in the lightened state seen above- but still, it is there, and visible, so it was not at least, totally erased. I agree with Jan that this find begs the question, “How could Voynich overlook it originally”, and also that it is possible that one interpretation is that it original- that is, not forged. I feel another interpretation of Wilfred’s claiming to having overlooked it is that it is forged, too, and that he or someone added it to give the mysterious manuscript needed and missing provenance. Also, it is important to remember that Voynich did not share this Rotograph, nor any description of it, as seen. It sat, hidden, in his papers, until his death. Why? There is no way to know of course. Another consideration is that even if this signature was erased at some point, it is visible: so why didn’t Baresch, Marci, or Kinner mention it? That had not occurred to me, and yet is a very important point. I would add that the 1666 Marci letter is all about the possible provenance of the Voynich, and so it seems it would have been of great importance to mention the faded (if it was at the time, faded, or partly erased), but visible, signature. Yet, he did not. Absolutely. When one considers that from the very start, this was obviously a rare and dazzling manuscript find, combined with this untreated Rotograph image which shows the signature was readable, why would he risk smearing chemicals all over the first page? OK, I didn’t claim this image would solve the issues surrounding the signature, but I do think it alters the landscape a bit. “…shows the signature quite clearly… …there are also some traces of liquid there, maybe it is the oldest picture “after treatment”. There were probably several chemicals used subsequently (as can be judged by contemporary colored scan) and probably several experiments were made directly on the original. That would explain the extensive damage we can see today. The chemicals are apparently still working, activated probably by light and other factors”. It looks like the whole signature business is only a superficial problem, however it is not. It is a VERY important problem. True, Horczicky himself did not add anything to the VM story, we even do not know if he ever tried to solve it. However his name was for Voynich the MISSING LINK between Baresh (or Marci) and Rudolph II (and from him to Bacon). Originally, Voynich claimed the writing was the dedication to Horczicky by Rudolph – he was of course only following Mnishowsky’s rumor, passed on by Marci. Now we know the writing is not in Rudolph’s hand and that Bacon is not the author (carbon dating). As far as we know now, Rudolph might not even have the VM at all, Horczicky could have got it elsewhere. As for Dee, he was first brought in the game by Voynich himself. So we are stuck with Horczicky being the first directly proven owner of the VM. His name “Tepenec” gives us the temporary location of the VM (Prague) and the earliest date he possibly got it – his nobilization (1608), provided he wrote that immediately afterwards :-). It is actually the earliest date of the VM which is really DIRECTLY documented (by such signature). Then again, if it is not in his hand it could have been written there in any time later by anybody. If however the signature is a hoax, we are left only with the letter by Baresch (1639, or 1637 if we consider the first, now lost letter) and we do not know where HE got it. There would be rather difficult to go then further back in time, the way back to the author. And so it is, we have a very small fire, with very little fuel- and perhaps each little twig of information will cause it to swell up a bit, and help in some small way to further illuminate this very intractable mystery. This entry was posted on July 14, 2013 at 2:24 pm and is filed under Dating the VMs, history & provenance. You can follow any responses to this entry through the RSS 2.0 feed. You can leave a response, or trackback from your own site. i.e it was first seen on the copy, not the original. Very good points, Greg… Thanks! In thinking more, and re-reading your comment, I think you are describing two different film types (because any film not sensitive to red would also not tend to “…[bring] out reddish details which would have been hard or impossible to see under daylight”- it would hide them). I have used lithographic films, which were not sensitive to blues and green, but sensitive to reds. But I also used bromide darkroom papers, which were not sensitive to reds, but would pick up the blues and greens… partly for the reason you state, the darkroom light would not expose the paper. Of course which type of film or paper used would help explain whether the signature tended to cyan, or to magenta. So on “Rotograph”, which I had to look up, I see that the word sometimes describes the rotary technique for printing long strips of paper, such as in the manufacture of postcards; but also the technique used when copying documents: “a photographic white-on-black print (as of a manuscript or book) made directly on bromide paper by the use of a reversing prism without a negative”. I would guess the term used here, in the note, refers to the latter. Then we might also guess that this picture is a negative of the negative Rotograph original, or more accurately, the positive made from it. In any case, knowing which type of film or paper type might have been used in this case, would help us understand what type of ink or pencil the signature is in. This does not change your point: that is, the possible reason that others may not have seen this before Wilfred’s imaging of it, but rather expands on it. What are your thoughts? there is a photo of some men from Shackleton’s polar expedition, taken on orthochromatic (i.e. red-insensitive film) in 1909. The red parts of the flag are dark and clearly contrast with the blue parts, which are very bright. By the way, you may remember early photocopier machines, which had a green light – you had to be careful if you had a document with highlighter marks, if they were green they would not show up at all, if they were red the mark might be too dark to read the text underneath. Same principle. This was also why printers and artists used blue markup pencils, which would not show up under the orthochromatic process used to expose photosensitive printing plates. “Rotograph” is used in the sense of copying documents, in the 1921 paper Wilfrid used “photostat” which is an equivalent term (“rotograph” I think was a trademark name which later became genericised much like “xerograph”). The process used the same bromide paper you mention, which as you say is blue/green sensitive, i.e. orthochromatic, and easy enough to handle under darkroom lights. Of course for copying text documents this was more than enough. It worked as you say, first a negative was made and then this was copied again to make one or more positives. However, even without knowing that we could be fairly certain the process was orthochromatic, because at the time almost all photography was. Panchromatic emulsions were invented in the early 1900s, but at the time Wilfrid would have done his copies in perhaps the early to mid 1910s they were still only available on glass plates, and were very expensive, in addition to needing special handling. They didn’t become common until the 1920s. Oh, and it is quite clear from the 1921 paper that he neither treated it to see if there was a signature, nor accidentally spilled developer on the MS. Those are later inventions by the ‘rumour mill’. But then what is the explanation for the stains? Sorry, I’m not sure if my comment was clear. Wilfrid certainly treated the MS, but as the 1921 paper makes clear, he did so only after seeing a hint of a signature on the first rotograph. He did not treat it ‘blindly’ in the hope of finding something, neither did he accidentally spill anything on the MS. That was what I meant. Now, staining. Well as regards staining resulting from the ‘enhancement’ – as Jan has said, multiple washes of chemicals, and the chemicals continuing to work over time, could have caused additional staining after Wilfrid’s attempt at enhancement. Particularly as f1 was (and is) fairly dirty, possibly due to having been exposed at some point – we know the MS was rebound with a new cover. So there could have been patches of dirt or grease on the folio, invisible previously, but which reacted with Wilfrid’s chemicals to give uneven staining. Of course some stains probably pre-date the ‘enhancement’ as well. Now that, thanks to you, we have the pre-enhancement rotograph it can be compared to the later images. I see what you meant, then. Another thing I had wondered (you can see I never explored this issue very deeply!) was what chemicals might have been used. I mean, was there an accepted method of enhancing traces of faint ink (maybe for palimpsets? ), or was Wilfred experimenting on his own? Also, it seems to me that this would be very risky, unless something that was part of forensic investigation already, so I would assume he had some reason to believe it would work, and not simply wash away the name, or whatever. And another thing, it seems to me that if such techniques were known and used in his time, and not his invention, it would be helpful to know if they were used only in certain cases… such as for pencil, and not ink, for instance, which might give a clue as to what the name is written in. And if different, accepted chemicals were used, for ink and pencil, then that could help. So do we know these things? The second picture looks like the one Voynich reproduced in his 1921 paper. Clearly, photocopies or scans of that paper do not show nearly this detail. Seeing the MS under UV light brings out the signature, and the sequence number below it, even more clearly. It’s a capital N with a small superscript o, and two slashes through the N. The number is not clear, but 9 is my best guess. Rene, thank you for the info. I’m having trouble seeing the “no” and “9”, but I would be hard pressed to offer an alternative. Rich. Regarding the chemicals (sorry, for some reason it won’t let me “thread” the reply). Yes, you are right to bring up palimpsests – in the 19th century, before photographic methods became available, historians and librarians would use chemicals to try to recover the erased ink. The idea is to try to bind to residues of the ink, particularly colourless or pale iron salts which might remain in the paper, and form a coloured compound. The simplest method used was just tannic acid, the same as in the production of iron gall ink (the galls provided the acid), and for the same reason – it produces dark compounds with iron salts. Of course the acid is very damaging over time (just as poorly formulated iron gall ink would be). Other methods appear to have used suplhur compounds or ammonia compounds. I would imagine these methods were widely known in the antiquarian book trade, and amongst historians and librarians, and of course to Wilfrid who was a chemist by profession – the basic chemistry itself is actually fairly simple, any competent chemist or student of chemistry could come up with half a dozen plausible reactions, the major issues being picking one which won’t cause damage or react with things other than the ink (and of course any unknown contaminants in the ink). And of course guessing the original ink itself, but most inks used in Europe up until relatively recently contained at least some iron. It’s quite a good short introduction. Of course the equation changes if the signature was not in ink, but in pencil, or metalpoint (as suggested by an apparent indentation). The chemistry required would be different, and I’m not aware of any sources on that. Very good information, Greg. Thank you… Rich. I found a bit of info along these lines in a book I have called “Scientific Aids in the Study of Manuscripts” ( R.B. Haselden – 1935 ). It confirms the use of ammonium-hydrogen sulphide to enhance faded inks, but warns against its use except as a last resort due to the general uncertain effect of chemical reagents and their potential to damage a manuscript. The internet archive has this copy as well as 2 others dated 1871. Very interesting, Ernest. Wouldn’t it be great to run a test on vellum, with samples of iron gall ink, pencil (erased?) and others, to see the effect? Rich. Hi Ernest – thanks for that, very interesting! Hi Greg: I don’t need a few hundred years… just a hundred(ha!). But perhaps I will try this, because I do hope to get some vellum for various purposes. Adding that to the list would be cool. Hi Richi. You write well. I read everything you write. Asked why the signature is deleted. You have answered itself. Thank you, Josef. You are very kind. Rich. 2). You have answered itself. In writing on Nill. Voynich wanted more money. Tepenec nobody cares. (disinterest). That signature erased. Bacon is known. A more desirable. A gentlemen Habdank Voynich decipher handwriting. It is written in the letter. Voynich knew more. Than you think. ( letter Beinecke, it is signed E – L – Voynich). The letter is is very important. It has written manual for deciphering handwriting. 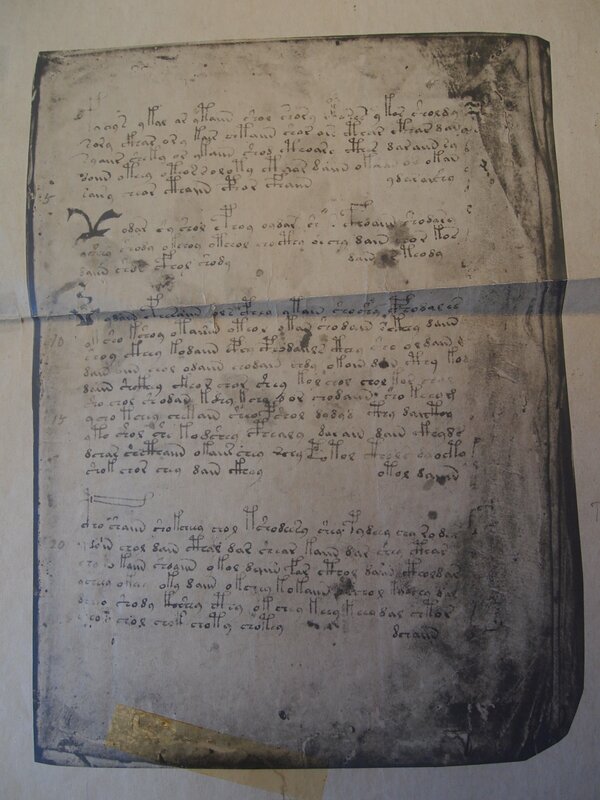 The letter also says that the manuscript is Czech. This proves that the Voynich deciphered manuscript. Josef: I think you are saying, unless I misunderstand, that you believe there is a letter in the Beinecke, signed by E.L. (Ethel) Voynich, which has instructions for deciphering the Voynich. Is this correct? I believe I have seen all the boxes there, which would contain such a letter, and so no such thing. Nor has anyone else who has seen this collection. But more importantly, all the other writings of Ethel, and Nill for that matter, strongly imply that they did not have a solution, in Czech or any other language. Both of these women continued to work on the Voynich problem for the rest of their lives. If they had a solution, they would not have done so. The closest story to the one you relate, that I can think of, is a certain group of pseudonymous authors, publishers, and publicists, who recently claimed to have a letter by Wilfred Voynich, in which HE claimed that the Voynich was faked by him. These people contacted me privately, and attempted to get me to write about, and promote, their novel… as a partially true account. While I do think the idea Wilfred may have faked this is an open possibility (which may have caused them to see me as an easy “mark”), and I am working on that idea, I also am certain that there is no merit to their claims. It was a cheap publicity stunt. But all that being said, I do certainly agree with you that Voynich was very interested in the Roger Bacon attribution, very much for the reason you state: It would be worth a great deal more money than an anonymous manuscript. One of my upcoming blog posts will show that this is the case, very clearly, despite having been told that since Voynich did not openly try to sell it, that he was not interested in its value, therefore it probably is not a fake. Well whether or not he can be described as having tried to sell it, he was very interested in its value, and “yes”, was very interested in it being a Roger Bacon manuscript. He “pushed” that attribution, and stifled others. So did Ethel, and Nill. However, the letter being signed by Tepenec would support his Roger Bacon theory, not work against it, as it helps place the manuscript closer to Rudolf II, and therefore supports that it is the manuscript described in the 1666 Marci letter. So I don’t think it would have been erased for this reason. But again, I apologize if I misunderstood your points, and also, I apologize for only being able to respond in English. All the best, Rich. That should read, “However, the MS. being signed by Tepenec…”. I do not think. I do not know. The entire letter is encrypted. In the same way as the manuscript. Habdank Michael made on the manuscript 18 years. 18 years, no break, wold be a great shame. He broke the code. A wrote the letter. Voynich writes in a letter to his findings and conclusions of their research. Repair : I know that. One hundred percent. Not fake manuscript. Michael Voynich not. But deciphering. It says in the letter. ( He writes in the letter). All the best , Joseph. Hi Josef: You seem to be referring to a letter written in the Czech language. Is this correct? What letter are you talking about? Where can it be seen? Thanks, Rich. Postscript: I took off a couple of your responses, to keep this simple and understandable. Rich. What letter are you talking about ? I’m talking about the letter.Which is the Beinecke website. The letter is encrypted. The letter is a guide to deciphering. At the same time it is written : Manuscript is written in the Czech language. Joseph: I can tell you are very frustrated, and also that you are very sure you have the answer. I don’t personally think you do have the answer. That is not meant as an insult to you, it is only that I think you are incorrect. I have read your blog as best I can, and your solution does not seem to be correct. But I don’t understand Czech. To read your site I must use Google translate. I have done this several times, and looked it over, and don’t believe you have the answer. But perhaps if I could understand the Czech language, I would understand your translation better, and maybe I would change my mind. As for the letter… I do see you mean Ethel’s letter, meant to be opened after her death, which explains where Wilfred really got the Voynich. But I see no mention of Czech in that letter, nor any translation of the letter out of English, into anything else. And not that it matters, but Voynich was not Jewish. You state this often in your blog, and on the web, and in comments… but he was not Jewish. He was Catholic. In fact, he is buried in a Catholic only cemetery, about 45 minutes from me. My father is buried in the same cemetery, in fact. Rich. Everything is written in the letter is just smoke ! Habdank is what ? Habdank is its original name. Habdank is a Jewish name. And Voynich converted to a Catholic. Thank you Josef. If anyone would like to check out Josef’s theories and translations… and please, if a Czech speaker would like to do this, it would be helpful… the link is above. Rich. I wanted to nudge forward. If you’re not comfortable. Excuse me. Josef: That is an unfair characterization of my position on your ideas. I am very “comfortable” with you exploring your Czech theory, and I’ve always been very supportive and helpful to you, trying to get your idea out there. I think I have given you a fair hearing on this and other posts, and still encourage others to read your ideas. If you look at my list of blog links on my first page, you will see your blog there. However, the presence of “Tepenecz” does not mean that Tepenecz wrote the Voynich, it only implies that he owned it. So for Wilfred Voynich, having the signature supported a Roger Bacon attribution, as it helps secure the provenance as leading to Rudolf’s court (or at least, closer to it). The signature helps the Voynich better match the Marci letter claims. Yes, “Bacon” is “…more desirable”. Erasing the signature would be a bad thing for Wilfred, I mean, and not help him. Rich, I have also links you in the first place. I’m already a manuscript at the end of his research. Already two years. In the manuscript there are many names. First name is on the cover. It’s Elizabeth ( Czech language , Eliška). Other names are Anna Hlohovská. It was the mother of Elizabeth. etc. Tepenec name is just name. The name Tepenec write Hurych about 10 years. But I, for one thing. Still lokinng for the language in which the manuscript written. And it the Voynich writes in the letter. At the same there writing code and instructions for decryption. Same as on page 116. So I wrote it because I thought you’d be interested. Encoding handwriting is very difficult. There’s a huge difference between the English language and Czech language. That’s why I wanted to help. Very good then, Josef: You have your idea out there, and I am sure that anyone who knows about the Voynich will see your work. After that, it is up to each person to decide on the merits, as is the same with anyone else’s ideas. If you are correct, then this will be clear. Rich. Hi Rich. How do you write that you have little fuel. So gave you a big cart twigs. “Whether the Voynich ms. is real or not, the signature is added by Wilfred, or someone, to strengthen provenance. But since the letters do not mention Tepencz, this signature could not be dark and obvious. If dark and obvious, it does not fit the letters, which do not mention it. But we now know it was dark enough to BE obvious at first, as seen on the un-released f1r, before treatment. So that version was suppressed… and a story concocted as to how chemicals needed to be applied to see the what was there. That way, both conditions were fulfilled… Voynich had his signature provenance, but its lack of mention by previous players is explained. “The problem for Voynich’s story is that the photo of pre-treatment survived, for us to find. This is why it is interesting to see the note on the photo, stating, “To be kept- Rotograph without autograph before it was chemically restored”. I mean, “thank you” whomever… presumably Nill, Wilfred, or Ethel… for keeping it! But why would this even be an issue? With all the post-treatment photostats out there, why would keeping the one pre-treatment picture even be an issue? It should be gold. And then, it is a very small copy, compared to the others. The suppression of this photo, the presence of just a small copy of it, too, both support the idea that presence of the signature before treatment was not something that Wilfred wanted known, and we could understand this, as it does not fit the story line very well to have it shown. It shows him to be disingenuous, and calls into question whether “the letters” are discussing the Voynich at all. “So I strongly disagree that this is not a problem, for the reasons presented. I think it is a huge wound on the story, that only has the smallest bandages to try fruitlessly to cover it up.